You may have heard that the Joye 510 is the most effective electronic cigarette ever made and, because of that, is the most popular (among those in the know)... and even won something called the Vapy Award. Well, you heard right! But what is a 'Joye 510'? Why is it so sensational? What should you order to make it work? And how do you use it? Well, you've come to the right place; this guide is where all secrets will be revealed! People who use electronic cigarettes are vapers who vape the vapor of personal vaporizers (PVs - another name for e-cigarettes)... just as smokers smoke the burning tobacco of traditional cigarettes, cigars, and pipes. Milli (i.e., metric) measurements are used in this world: millimeter length of e-cigs (use a 100s cigarette as your benchmark, i.e., 100 mm)... milliliters of juice (30 ml = 1 oz.)... milligrams of nicotine (e.g., 'High' = ~18 mg)... and milliamp hours (mAh – how long or how many puffs before the battery needs to be recharged). Throat hit (TH) is that rush you get when inhaling (centered on a tickle or pinched feeling in the back of the throat). 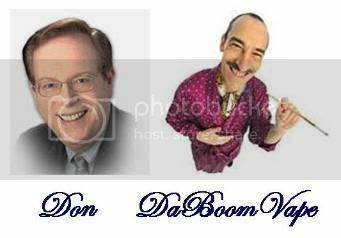 See also theGlossary of terms and abbreviations Glossary of terms and abbreviations thread at Vapers Forum. 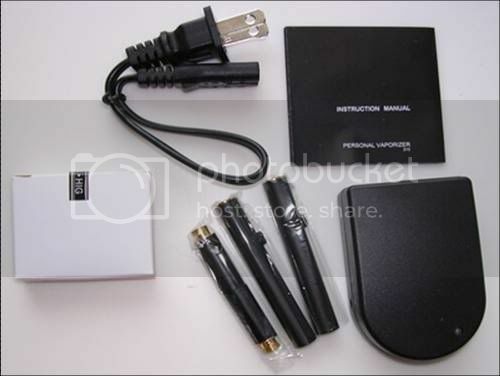 The e-cigarette itself (i.e., the hardware) is a battery-powered device for vaporizing the liquid put in it. There are many different models in varying shapes, sizes, and effectiveness. Most look somewhat similar to an analog cigarette, but are a bit longer. Some look like cigars or pipes; and some are much longer and/or fatter than analogs and have weird shapes. We'll talk about all this in greater detail when we describe the Joye 510 model. Or USP-grade VG (Vegetable Glycerin - more syrupy, and derived from veggies). PG generates somewhat more flavor and throat hit; VG produces more vapor. Cignot carries both PG and VG based e-liquid. Plus a selectable amount of nicotine (derived from tobacco) or no nicotine at all. For additional basic information about e-cigarettes and e-liquid, see Parts 1, 2, and 3 of my Wonderful World of Vaping Illustrated Guide on Vapers Forum. What is a Joye 510? 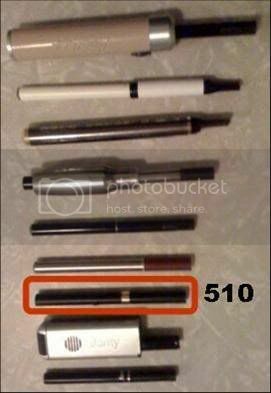 The Joye 510 is a 'Mini' class e-cig, i.e., much shorter than a 'Penstyle' (second from the top of this photo) but a bit longer than a regular cigarette-sized 'Super-Mini' (at the very bottom of the photo). It strikes what many of us find to be the perfect balance between performance and ease of handling. And it doesn't look anything like those strange-shaped things, e.g., the one at the top. a. 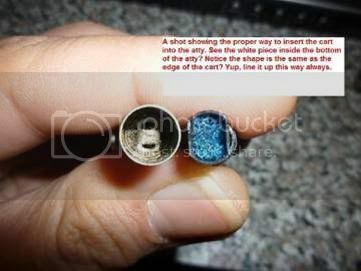 The cartridge (or cart) contains the porous material that absorbs the e-liquid. In the 510, the cartridge and mouthpiece are integrated and can be either flat ('whistle-tip') or round, both of which are sold by Cignot. b. The single most important component of the 510 is its atomizer (or atty). This is what takes the juice from the cartridge and magically transforms it into the vapor, flavor, and throat hit described in the next section; and it does so more effectively than almost every other e-cig. As shown in the photo on the right, the Joye 510 atomizer is unexposed, sitting inside a tube, enabling non-messy dripping (an alternative to refilling carts) and delivery of a smooth inhalation experience. c. The rechargeable battery (or batt) of course, powers the atomizer. Most e-cig batteries originally had an automatic switch (e.g., turned on by sucking on the mouthpiece or by sound or movement) as in the battery shown on the left. 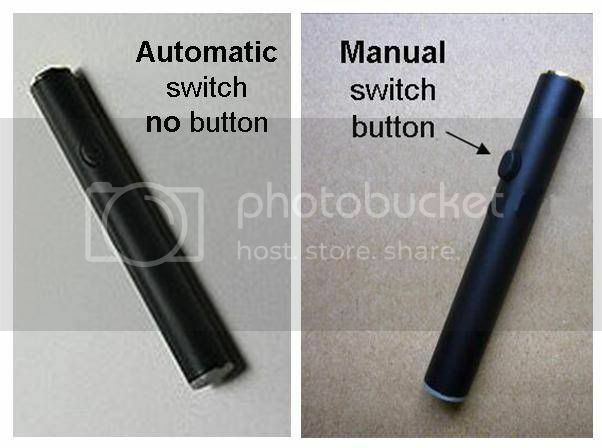 An increasing number are manual (turned on by pressing a button on the side of the battery) as shown in the photo on the right. 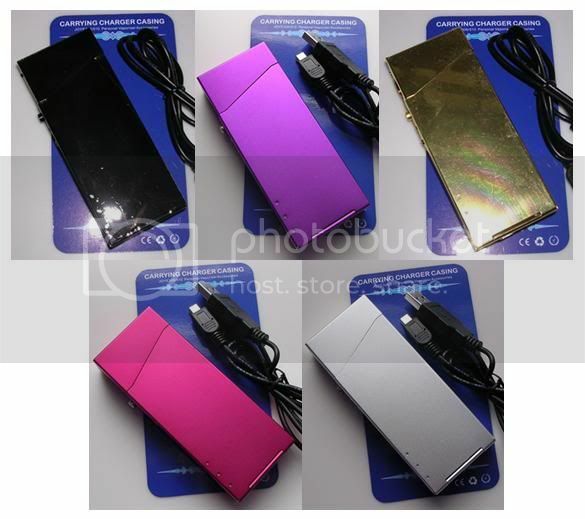 The PCC is your on-the-go battery charger. When the battery you are vaping with poops out, you just swap it for the freshly recharged one - even when you are away from a power outlet. So, every hour or three (depending on how heavily you vape), you open the PCC in your shirt pocket or purse and switch batteries. This will keep you going all day and evening long. Charge the PCC itself while you sleep. In addition to charging one of your batteries, the Joye 510 PCC has three extra slots to hold three cartridges or a spare atomizer and two carts. This provides a constant charge to the atomizer, so no recharging is ever required. 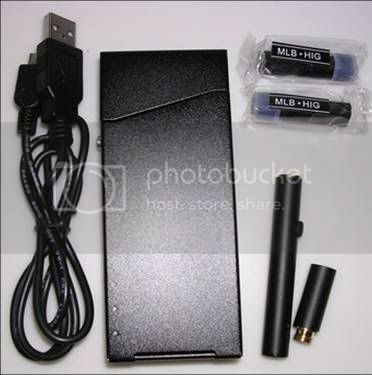 It looks, feels and operates like the battery on a portable 510, just with a slender cord coming out the end into a box with a battery and plugged into a USB port on your computer. Cignot's $35 Joye 510 NO BOX Kit contains all you need to get rolling ... and (by adding e-liquid to your order) continue vaping for many weeks or months. Five prefilled cartridges (NON Menthol High). One wall charger - for bringing exhausted batteries back to life. An illustrated instruction manual - it's small in size, but comprehensive in basic operating instructions ... and written in real English (i.e., not an awkward translation of Chinese). Those two batteries (fully charged) will keep most vapers going for an evening out ... and (if you are an occasional vaper) for a day at work. This will also sustain anyone who has access to a wall socket during the day (to recharge your batteries). Just like a computer, as important as the hardware is, an electronic cigarette is just a paperweight without software. For an e-cig, the software is the e-liquid. The hardware in the starter kit will likely keep you going for one or two months, but the five prefilled cartridges will last you only a couple days. Other PG and VG - This liquid is produced by Boge Technology Co Ltd. Boge carries a myriad of national and international certifications including ISO9001:2008 compliance. Joye PG - premium e-liquid made by the manufacturer of the Joye 510. BASIC VG - US made exclusively for Cignot with a focus on natural flavorings. ECOpure (premier pure-VG, UK-manufactured e-liquid, 0-36mg strength) in five flavors: Fresh, Regular, Rich, Menthol, and an ECOpure-based English Toffee (unique to Cignot) ... and 36mg unflavored Krystal (for cutting with 0mg pure VG & distilled water and adding your own flavoring). The $25 PCC to charge one battery while vaping the other (and hold an extra atty and three carts), even when you are out and about. And/or the $22 USB Passthrough to save your two charged batteries for when you are away from the computer. The first thing to do when your order arrives is to charge your batteries fully - at least until the LED on the charger turns from red to green, although four to eight hours is recommended for the initial charge. Connect the charger and cord and plug into a wall outlet or power strip. Screw a battery into the charger (notice that the LED on the battery flashes briefly and the light on the charger turns red). If you ordered the PCC, charge that fully as well. 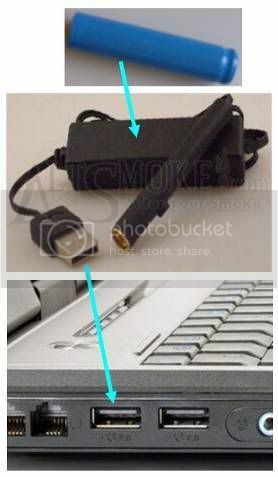 Connect the miniUSB cable to the Joye 510 PCC and plug the cable into a USB port on your computer. 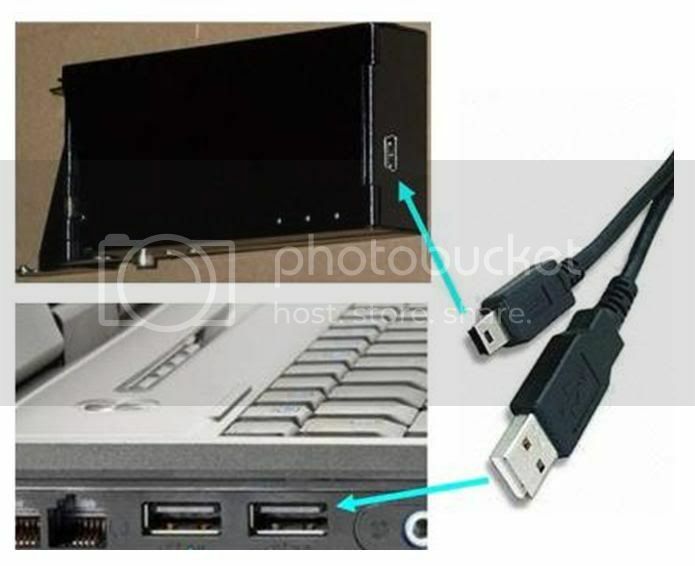 [The tiny plug of the miniUSB cord goes into the bottom of your PCC; the larger plug goes into a USB port on your computer.] The red light will turn on and, when the PCC is fully charged, the green light turns on. Tip: You can charge one of your batteries in the PCC, as you are charging the PCC itself. 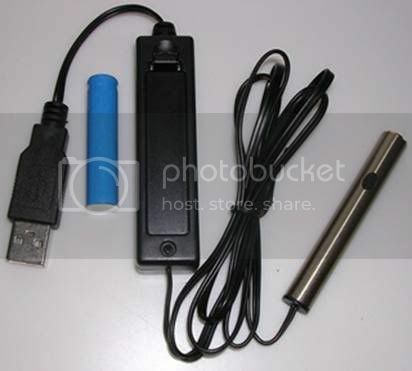 If you ordered the USB Passthrough, you can begin vaping immediately, even while your batteries are charging. Insert that slender blue battery into the black box on the cord (line it up the end with the bump at the + sign and the flat end at the spring). 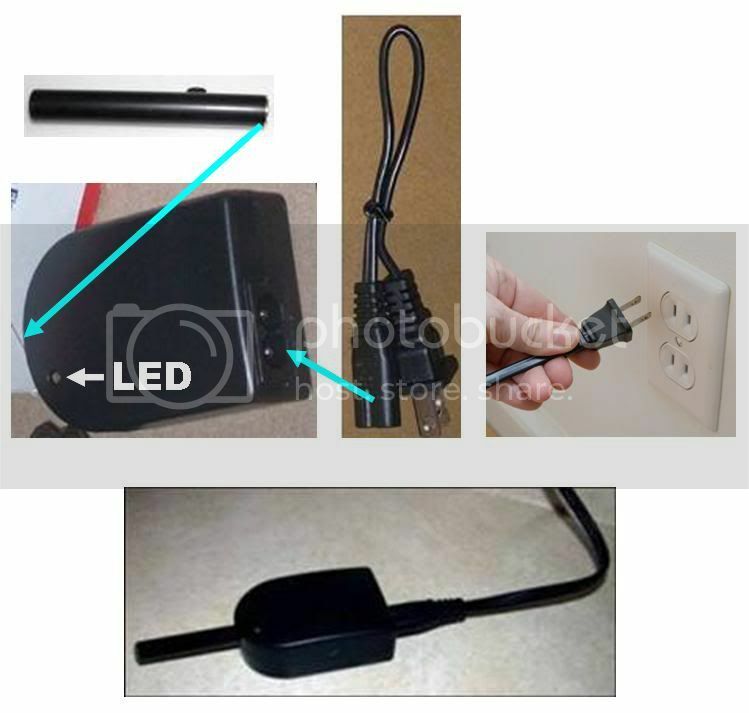 Close the little black box and plug the cord into your computer. From now on, you can use your PT just like a battery, following the instructions in the next section. 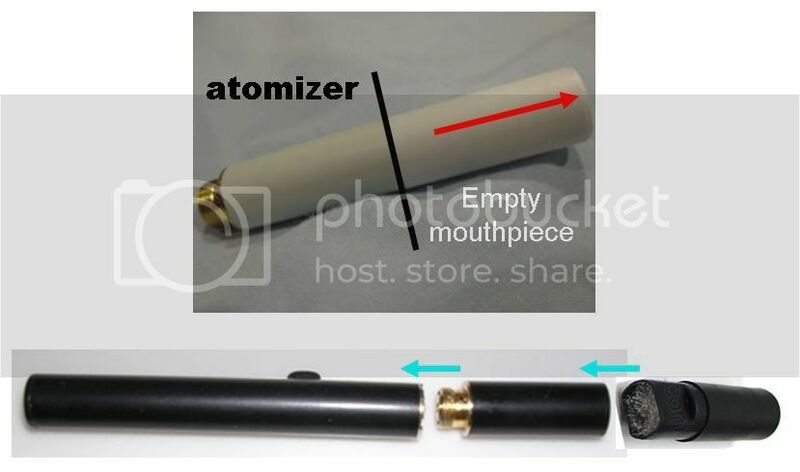 Remove the temporary empty mouthpiece from the atomizer and put it to the side (you might want to use that in the future if you decide to 'drip'). Open up one of the cartridge packets. Remove the plastic 'condom' on the end (which was keeping the juice moist). Push the cartridge into the open end of the atomizer. Screw the atomizer/cartomizer into a fully charged battery (or passthrough). Now the big moment! You stick it in your mouth and puff. [If you have an automatic battery, skip to the next paragraph.] Nothing happens. Oh, that's right! I forgot to press the button. So you do it again, pressing the button while you inhale. Oh, I felt something there, but not much. And where's this vapor everybody talks about? Has Cignot let me down? Nope. One aspect of puffing on an e-cig that neither of them mentions is the two-phase inhale that most of us use. That long leisurely drag is not directly into your lungs (as with an analog), but into your mouth ... and then inhale into your lungs. Why don't you give it a try? That was much better, wasn't it? Lots of vapor and you really felt it. Oh, you want to go right back and do it again, huh? OK! Have at it ... and start evolving your own puffing/inhaling style! To do that, let's bring in ECF's and VF's Kristin. Her Everything You Ever Wanted to Know About Your 510 tutorial provides the foundation for effective continued use of your Joye 510. [I'll be quoting only brief portions here. I urge you to read it thoroughly: now and several times during the next week or so.] We'll supplement her wisdom with that of others from the vaping community, who will be joining us in photos. ...blow out your atomizer. The atomizer comes from the factory with a 'primer fluid' to keep it moist, but it tastes terrible. [Actually, I don't think it’s that bad.] Simply place your mouth over the threaded end and blow hard [and steadily] onto a paper towel until no more liquid comes out. 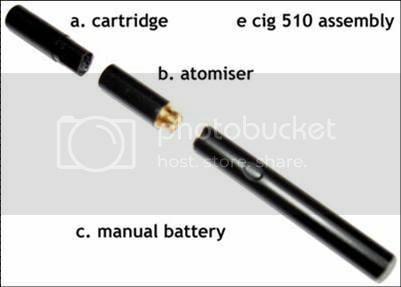 There may still be some primer fluid on the atomizer, so drip TWO drops [of e-liquid] directly onto the metal coil in the atomizer, attach the [mouthpiece/cartridge] to the atomizer and then screw the atomizer onto the fully charged battery. [Then]...take a few puffs into your mouth [but don't inhale into your lungs] and blow it directly out, to get the liquid flowing into the atomizer….If you continue to taste a burnt/chemical taste, this is the atomizer burning off the primer fluid. Continue to 'puff & blow' until the taste diminishes. From then on you will be able to vape contentedly with that atomizer. After awhile, you'll notice the flavor, vapor, and/or TH (i.e., throat hit) begin to falter. That means you need to 'top off' your cartridge. 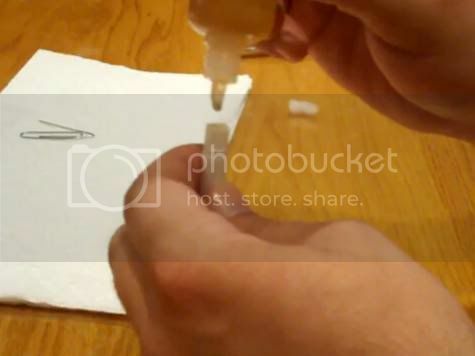 Use the dropper to drip the liquid until it no longer absorbs into the filler. Usually around 15 drops [with a blank cartridge]. To ensure that the liquid is fully absorbed throughout the cartridge filling, it can be helpful to briefly insert a bent paper clip between the filler and the side of the cart. If some liquid pools at the top, dab with a paper towel. Drip two drops directly onto the metal coil in the atomizer to prime it, push the cartridge back into the atty, and continue vaping. There is a lot more you can learn about Cignot's sensational Joye 510 and how to enjoy it. Browse the threads in ECF's Cignot and 510 Model Specific forums and search throughout ECF and Vapers Forum. Of course, for any questions about the items you receive – or want to order – from Cignot, don't hesitate to contact them. Enjoy your Joye 510 electronic cigarette and accessories, all the great Cignot e-liquid ... and your interactions with one of the very best vaping suppliers in the world!